Z57 Inc., a real estate Internet marketing firm, is pleased to announce the 500th graduate of its Z57 Academy - ZPro 100 Series Realtor Internet and social media marketing courses. Minneapolis/St. Paul-based real estate agent, Lin Warren of Midwest Realty Network, achieved his ZPro certification on August 19, 2011. Z57 Inc. is pleased to announce REALTOR® Lin Warren is the 500th graduate of its Z57 Academy - ZPro 100 Series Real Estate Internet and social media marketing courses. Selling homes online requires tried and proven marketing tactics. With our 500th graduate we have proof positive that our ZPro 100 courses make a significant difference. Z57, Inc., a leading provider of real estate online marketing services, announced today that Minneapolis/St. Paul-based real estate agent, Lin Warren of Midwest Realty Network, was Z57 Academy’s 500th graduate. Warren earned his ZPro Certification on August 19 by completing the comprehensive ZPro 100 Series course work. He effectively demonstrated that he has mastered internet marketing strategies to help both his sellers and buyers. Five hundred graduates is an important milestone for Z57 Academy, the education division of Z57. It means there are now 500 real estate agents in the marketplace armed with new skill sets in valuable online marketing. These ZPro graduates have mastered a comprehensive course load which covered topics such as: social media marketing, optimizing traffic and visibility, single property websites, online and offline marketing campaigns and much more. In addition graduating real estate professionals earn their ZPro designation, and now qualify for Z57 website product incentives and upgrades. “The ZPro Academy has opened my eyes to the marketing opportunities the internet can provide. The instruction has been amazing, thorough, thoughtful, and patient. Since I started the Z57 Academy, my business has skyrocketed. With the increased exposure of my website, along with my online postings, both strategies have netted me four sales in the last month,” said 500th graduate Lin Warren. 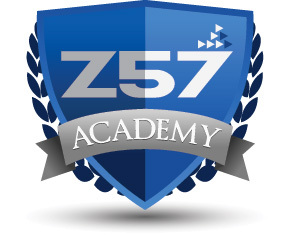 In response to the need for Realtors to be educated in how to capitalize on the power of the internet to generate quality leads, Z57 recently established its Z57 Academy. The academy’s inaugural ZPro Certification program consists of five courses. The one-on-one classes provide actionable steps for agents to use to make their website more marketable. The ZPro 100 Series courses cover: Understanding fast start do’s and don’ts; posting for results; selling with single property web sites; promoting your business; and selling with Facebook. San Diego-based Z57, Inc. is a personal Web marketing company for thousands of real estate professionals. Founded in 1998, the company specializes in feature-rich designed websites, with content, listings, lead capture and conversion tools, buyer/seller traffic generation through effective online marketing plans, listing syndication, Search Engine Optimization, drip e-mail marketing and a highly trained and responsive customer service team. Z57 provides clients nationwide with proven real estate solutions matched with personal service from more than 150 dedicated employees. The company’s education division, Z57 Academy, specializes in courses to educate Realtors in Internet marketing strategies. The Southern California Internet marketing firm was recognized as an Inc. 5000 company and San Diego's No. 1 Web Development and Design Company. For more information call (800) 899-8148 or visit http://www.Z57.com.